Interdisciplinary artist and SAIC alum Dread Scott (BFA 1989) is well known for his controversial work What is the Proper Way to Display a US Flag? which was originally displayed during his time as a student. 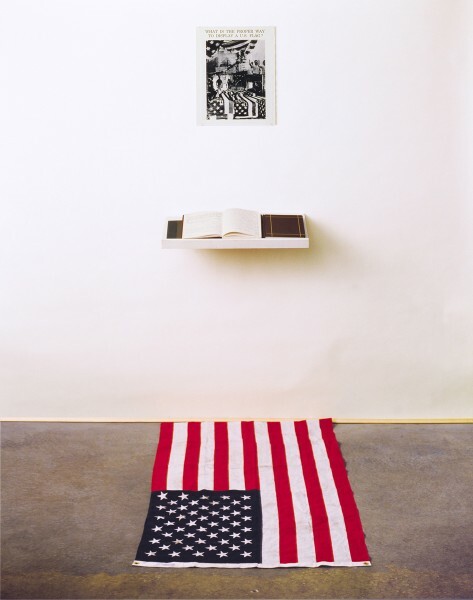 The installation comprised an American flag displayed on the ground beneath a photomontage and a comment book. Visitors were given the option of standing on the flag while they recorded their impressions of the work in the comment book. Scott’s recent TED Talk: How Art Can Shape America’s Conversation About Freedom touched on his previous and current work. When Scott’s US flag piece was originally displayed it received both positive and negative feedback from the public and was even deemed a “disgrace” by former President George H.W. Bush. During Scott’s TED Talk he addressed his involvement in the landmark Supreme Court case that resulted in the prevention of the US government making the protection of the American flag mandatory. “Those who viewed the American flag as standing for everything oppressive felt that they had a voice. Changing anything whether it’s conventional ideas about US national symbols, traditional thinking challenged by scientific breakthrough or ousting an authoritarian president requires a lot of things. It requires courage, luck and also vision and boldness of action,” said Scott. Scott’s current project, Slave Rebellion Reenactment is a community-based performance that will restage and reinterpret the largest armed rebellion of enslaved people in North American history. According to the project's website it will involve hundreds of reenactors marching 26 miles over two days and take place upriver from New Orleans in the same locations where the 1811 German Coast Uprising took place.